Whatever version of Windows you’re using–from Windows 7 up to Windows 10–the registry is at the heart of your desktop experience. Software installs and compatibility, hardware operation and more are managed by a complex database of codes and numbers. When something goes wrong it can seem impossible to diagnose and repair the problem, and harder still to prevent a recurrence or make the subtle changes and tweaks required to fix the problem. 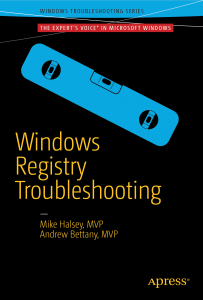 In this book we’ll take you inside the workings of the Registry, and teach you how to repair, modify and clean it to keep your PCs running smoothly.